Set up in 2010 as one element of the broad-based black economic empowerment transaction conducted by South African Breweries Ltd (SAB), the SAB Foundation is an independent trust that annually invests millions of rands towards developing entrepreneurship in South Africa. The SAB Foundation holds 8.4 million SAB Ltd shares and applies the dividend and special dividend income received from these shares for the benefit of the wider South African community. SAB Foundation was the first organisation in South Africa to received tax exemption and is registered as a tax exempt Small Business Funding Entity under section 10(1)(cQ) of the Income Tax Act. The provision of funding for small, medium and micro-sized enterprises, in order to contribute to the economic and social empowerment of historically disadvantaged persons, primarily (but not necessarily exclusively) by means of entrepreneurship development and with a priority focus on providing opportunities within small, medium and micro-sized enterprises for women and youth in the rural areas, as well as persons with disabilities. Mariska Henning has been with the SAB Foundation since inception and is a highly experienced and skilled programme manager. She heads up the roll out of the SAB Foundation programmes and is responsible for its overall operations and functioning. Andiswa Gumede is the SAB Foundation Enterprise Programme Coordinator. She has extensive experience in enterprise creation for development, with a focus on conducting situational analysis and feasibility studies. Prior to joining the SAB Foundation, she served as an Enterprise Development Practitioner at the CSIR. Andiswa holds a bachelor’s degree in agricultural business management and has a passion for building sustainable enterprises. Ntandokazi Nodada has made significant strides in South Africa’s start-up incubation and growth landscape. Passionate about shaping, supporting and mentoring entrepreneurs, Nodada has served in key positions at the New Generation Mindset - Enterprise and Supplier Development Programmes; The National Gazelles program for Mtiya Dynamics; the Climate Innovation Centre at The Innovation Hub; and the Mamelodi Business Clinic at the University of Pretoria. Wendy Simunyu is the SAB Foundation’s Social Impact Analyst. Prior to joining the SAB Foundation in 2019 she was a functional trainee within the Legal and Corporate Affairs Department at Ab-InBev. She is a qualified social worker from Wits University and a Golden Key International Honour Society member who is passionate about enhancing human well-being through economic and social empowerment. Thiloshnee Vythilingam is the SAB Foundation’s coordinator. She joined the Foundation in 2017 and prior to that worked across SAB’s internal and external communications function. She holds a BA degree in communication science from UNISA. She is passionate about helping people and served as a SAB Soul Ambassador for five years. Moss Ngoasheng is co-founder of Safika Holdings, an investment holding company with a broad interest in mining, industrial, gaming financial services, human resources, telecommunication, media and the technology sectors of the economy. Moss served from 1995 to 2000 as economic advisor in the South African Presidency and spent a number of years on the African National Congress (ANC’s) economic policy unit. He has consulted to the World Bank and National Housing Forum (South Africa) on aspects of economic policy in South Africa and sits on the board of Dimension Data (Middle East and Africa), South African Breweries and Winsaf – an Australian based Private Equity Fund and Business Leadership South Africa. He is also a member of Harvard University’s Index of African Governance Advisory Council and a Trustee of the Nelson Mandela Children’s Hospital. Dr William Rowland is the Manager of Resource Mobilisation and Public Relations at the South African Disability Development Trust (SADDT). Through his roles as President of the World Blind Union, Chairperson of the International Disability Alliance, and as a member of the United Nations Panel of Experts, he has monitored the implementation of the Standard Rules on Disability and is the honorary life president for both Disabled People South Africa and the South Africa National Council for the Blind. He has founded the Viva Trust, held a seat as a member of the SABC Board of Directors (1997 – 2003) and was a Council member of UNISA (2002 – 2003). William is now a council member of the University of Johannesburg. As if that wasn’t enough, he is also the founding Chairperson of the DEC Trust and represented the SANCB on the DEC Board of Trustees, serving from inception in 1996 to November 2005. William is a master’s graduate of the University of South Africa and holds a Doctorate of Philosophy from the University of Cape Town. He has extensive business leadership experience, political networks and knowledge of the disability sector and is a published author of poetry, children’s books, and academic works. Dr. Konji Sebati is the Chief Executive Officer of IPASA, the Innovative Pharmaceutical Association of South Africa. Konji is a medical practitioner by training with post-graduate diplomas in Health Planning Management and Hospital Administration, Paediatrics and Child Health. She gained extensive experience and networks throughout Africa and internationally due to her career in government, the pharmaceutical industry, her diplomatic tenure and working for the United Nations on Intellectual Property. She has over 25 years’ experience in the private and public sector; both in South Africa and within Africa, especially Kenya where she obtained her medical degree, and Ghana; and extensive networks in Tanzania, Malawi, Zambia, Nigeria and Cote d’Ivoire. Konji has also worked for several years in Corporate Affairs and with a Foundation when she was with Pfizer Pharmaceuticals. Her most recent experience as an international civil servant with the United Nations Agency, WIPO, the World Intellectual Property Organisation, was heading the Department of Global Challenges. Her work at WIPO also involved working with 187 Member States to agree on an international legal instrument to protect and promote Traditional Knowledge, Traditional Cultural Expressions and Genetic Resources. Konji sits on the Board of Medicines for Malaria Venture (MMV), a non-profit Research and Development Public-Private Partnership for new Malaria medicines. Zoleka Lisa is the SAB Corporate Affairs Director. She joined SAB in 2014, where her portfolio has been to lead special programmes that support the achievement of Procurement’s business objectives on a global and regional level, including driving continuous improvement, sustainability, intra/entrepreneurship and transformation for the Africa Zone. Prior to joining SAB / ABI, Zoleka was a Senior Manager in the Accenture Strategy division where she consulted across the consumer goods, retail and energy sectors as well as a few of the SOE’s, primarily responsible for leading projects requiring strategy development, cost optimisation, business model definition, journey management and procurement transformation. Zoleka holds a BSc Environmental and Geographical (UCT), a BSc Hons. in Geography and Environmental Science (Wits). Zoleka has attended a number of Executive Development programmes from Wits and LSE throughout her career. She currently serves on the SABMAS board. Richard Rivett-Carnac (a.k.a. Boris) is the SAB Mergers and Acquisitions Director. Before being appointed to run the SAB Thrive Fund, Boris’ roles within SAB included being District Manager of District Johannesburg Central, Executive Assistant to the former Managing Director, and was a member of the SABMiller plc Corporate Finance and Development team based in the United Kingdom focusing on mergers and acquisitions for the SABMiller plc Group. Prior to joining SABMiller plc in London in 2009, Boris qualified as a Chartered Accountant (SA) in Johannesburg with KPMG and then worked in London for 7 years in Investment Banking. Bishen Morgan is the SAB Sustainability and Supplier Development Director, responsible for delivering AB-InBev’s 2025 Sustainability Goals for the African business. These goals aim to contribute to an inclusive economy by transforming the supply chain to increase participation for woman, youth and previously disadvantaged groups. Previously, Bishen was the Commercial Procurement Director responsible for optimising marketing and sales investments across SABMiller’s African businesses. Before joining SAB, he held senior management roles at Nokia and BP. Bishen holds a Bachelor of Business Science from UCT and has completed Executive Development Programmes at Darden and Stanford Business schools. He currently serves on the boards of the SAB Provident Fund, the SAB Foundation and the Glass Recycling Company. Fetola is an enterprise development consultancy that supports the growth of small and medium sized enterprises and assists them to become independent, thriving businesses and qualified suppliers. The Innovation Hub is a leading science and technology park, that aims to promote the development and competitiveness of the Gauteng province through innovation. HeePD seeks to benefit people with disabilities by building and developing a Hub Employment Ecosystem for People with Disabilities. SaveAct facilitates the formation of savings and credit groups in rural communities as a simple but effective tool to fight poverty, as a foundation for building sustainable livelihoods, and as a means to empower women and other vulnerable groups. The Socionext programme has a very practical learning-by-doing format taking participants step-by-step through a series of practical exercises that result in a tested and validated business proposition. Lean Enterprise Acceleration Programmes started in 2011 focusing on developing and delivering comprehensive Enterprise and Supplier Development programmes for corporate clients as well as business support services to SMEs. 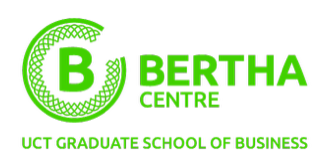 The Bertha Centre for Social Innovation and Entrepreneurship is the first academic centre in Africa dedicated to advancing social innovation and entrepreneurship.